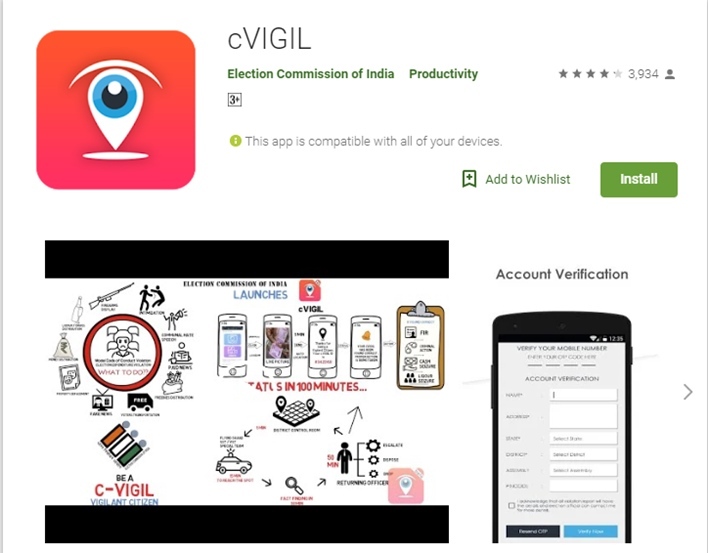 The Election Commission of India (ECI) has launched many apps and online services that citizens can make use during the Lok Sabha elctions. In this article, we will discuss ECI apps for Lok Sabha election 2019. First things first. Here is an over view of the 2019 election before we discuss the Apps in details. In Karnataka, voting for 28 Lok Sabha constituencies to be held in two phases – first phase voting will be on April 18 while the second phase voting to be held on April 23. In the first phase, voting for the constituencies of South Karnataka, Coastal Karnataka and Malnad Karnataka will take place. In the second phase, voting to be held in Mumbai, North, and Hyderabad Karnataka regions. This year all the district administrations are making elaborate arrangements to ensure above 80% voting. Under the Systematic Voters’ Education and Electoral Participation (SVEEP) all the houses holds are visited by the dedicated teams of officials to create awareness about the importance of voting. But still lakhs of voters are unaware whether they have voting rights? If their name is included in the voters’ list? Where is their voting center? How to lodge complaints if any party or leader found violating the Model Code of Conduct (MCC)? The Election Commission of India (ECI) developed over 10 apps to help the voters. Here is a list of some of the apps and how they are helpful to the voters in the Karnataka. The first and foremost thing one has to remember is the voting timings. According to the ECI authorities voting will start at 7 am and conclude at 6 pm. If the voter number is more the voting time will be extended till last person in the Queue will cast his vote. This is one of ECI apps for Lok Sabha election 2019 that can help citizens to record and report any violation of the he Model Code of Conduct. Below is how you can download and use the App. A resident can use this app in two ways i.e. as an anonymous user and registered user. A resident can register his name through OTP of his mobile number. Model Code of Conduct (MCC) violation incidents can be recorded or photo can be uploaded via this app. These visuals/ photos and details will be shared with the concerned Deputy Commissioner of a district. What Are The MCC Violations? Money distribution to the voters. Using vehicles for the campaign without permission. Use of private property without permission. Transporting the voters to the polling stations on the voting day. Open / public campaigning 48 hours before the voting. It is an exclusive app developed for the benefit of the voters of the Karnataka. This app is available on the Google Play Store. According to the authorities, this app provides information related to the Lok Sabha election in the Karnataka. This app is very helpful for people with disabilities. This app helps them to send alerts on their voting requirements, get customized feedback and support from the election officers. To hold public events, advanced permission is very much mandatory. The candidates and their agents can seek permission via this app. This app is also made available on the Google Play Store and it is also developed by the ECI. This app is designed to provide all the election-related information to the voters. This year, the ECI introduced a new feature to the election. Interested general public especially students can join the commission as the volunteers. The Election Commission is very active on the digital platforms. All the district level officials are launched their dedicated social media pages to ensure easy communication with the voters. The election is called as the festival of democracy. The government is spending several crores for each district in the state of Karnataka for the foolproof conduct of the election. On both the voting days, the tourist spots of the respective areas shut down. The concerned deputy commissioners already issued a notification in this regard. The tour operators, resort owners, managements and the lodging and boarding managers are directed to give rooms only after the verifying the EPIC number. It is the time to stand up for the cause of the country and vote for the development. For all the election-related queries one can visit the website of the election commission where all the details are updated on a real-time basis. Both voters and candidates can get all the information from here.